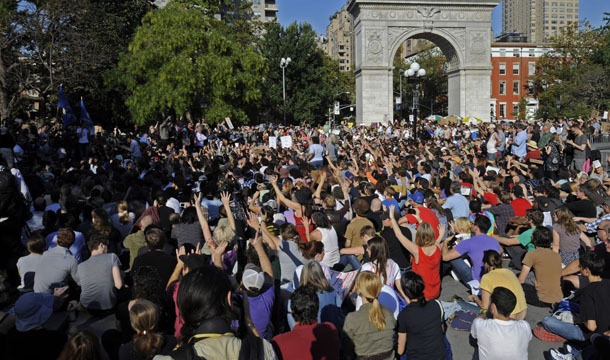 The Occupy Wall Street movement presents a growing chorus of millions who are fed up with mounting economic inequality in the United States. The movement reflects the frustrations of people across the country saddled by debt, working harder for less, and with less chance of getting ahead. It has captured our national attention by demonstrating that America’s economy is not working for most Americans today. But it is working for the richest 1 percent, who control two-fifths of the country’s wealth and get a quarter of all income. Some people in Washington think the right response to this economic inequality is to give more to the 1 percent and hope it reaches the rest of the country. They support tax cuts for the well off—and spending cuts to Social Security, Medicare, and Medicaid, and other programs that the middle class relies on. They want to slash education, energy, and technology investments that are the bridge to our future prosperity. To further the important public discussion on economic inequality catalyzed by the Occupy movement, we propose nine simple steps that policymakers can take immediately to reduce inequality, get our upside-down economy back on its feet, and begin restoring the promise of the American Dream—the idea that no matter who you are, if you work hard and play by the rules, you can succeed. To be sure, the modern economy is a complicated creature, and all our problems will not be solved by these nine ideas. But these common-sense measures, described in detail at the links, are actions that Congress could take today to strengthen the middle-class backbone of the economy and pave the way for a brighter future for everyone. Reduce student debt and hold colleges accountable. Federal student loan debt, piling up faster than credit card bills, will reach $1 trillion by the end of this year. The government backs these loans, so it should take the lead in preventing credit-ruining defaults and helping borrowers keep their debt loads manageable. The administration’s “Pay As You Earn” proposal, which allows borrowers to cap their student loan payments at 10 percent of discretionary income, is an important step, but it should go further. This income-based repayment option should be an automatic part of the student loan program, rather than a small, opt-in program. We should also hold colleges accountable when their students routinely fail to pay their loans or get meaningful work. And the government should give serious consideration to adopting for nonprofit and public colleges a version of the for-profit “gainful employment” rule, which penalizes schools that saddle students with overwhelming debt. Ease the crushing debt burden of mortgages. Homeownership has long been a source of economic security for middle-class Americans. But that came crashing down with the collapse of the housing market. One in four homeowners is currently “underwater,” owing more on their homes than the properties are worth. It is difficult to refinance a loan on an underwater mortgage, so these homeowners can’t take advantage of current low interest rates. If they could it would help them and the economy as a whole since they could do more with their income than pay down debt. When more borrowers can refinance their mortgages at lower interest rates, it is good for the consumer, good for the taxpayer, and good for the economy. The Obama administration should vigorously implement recently announced changes to the Home Affordable Refinance Program, or HARP, making it easier for underwater homeowners to refinance. But action shouldn’t stop there. There are still some unnecessary barriers to beneficial, competitive refinancing, and federal regulators should ensure financial institutions face significant consequences if they do not participate actively in such refinancing. Other reforms to help struggling homeowners should also be pursued. For borrowers who can no longer make their monthly mortgage payments but could afford to rent the same property, the Federal Housing Finance Administration should expand the Fannie Mae “deed for lease” program in which eligible homeowners have the option to exchange their mortgage for a monthly rental agreement. In this way more homes remain off the for-sale market and occupied, helping communities struggling with too many foreclosures. And through a carefully designed “lease-to-own” option, some of these new tenants could be given the opportunity to rebuild equity in the home over time though slightly higher rent payments. Repeal the Bush tax cuts for the wealthiest Americans. The evidence is in: Lower taxes for the rich don’t help the economy. They inflate the deficit and they weaken support for the middle class. At a time of mounting inequality, it’s long past time to repeal massive tax cuts for the rich passed last decade by President George W. Bush and a Republican-controlled Congress. Extending the Bush tax cuts for the wealthy, as conservatives are demanding, will cost about $90 billion over just the next two years. Instead, we could lower taxes even more for middle-income Americans; make sure that teachers, firefighters, and police officers aren’t laid off; rebuild crumbling roads and bridges; and invest in science and technology research. Congress should make permanent the lowered tax rates for the 98 percent of Americans earning less than $250,000 and ask the wealthiest among us to pay their fair share—by letting their rates go back to where they were under President Bill Clinton, when the economy was strong. Rein in government giveaways to corporations and the top 1 percent. Besides ultra-low tax rates for the wealthiest, our tax code is, in many ways, upside down. Many of the largest tax breaks disproportionately benefit the wealthy. Whether the purpose is to promote homeownership, retirement savings, or investment, many of our $1 trillion in annual tax breaks provide the largest subsidy to those who need them the least. This happens because deductions and exclusions are more valuable to those in higher tax brackets. Congress should make the upside-down subsidies right side up—making the benefits of special tax provisions the same for all. That’s only fair. The tax code is also stuffed with about $130 billion in annual tax expenditures benefiting businesses or industries. Many of these are indefensible giveaways, such as low taxes for hedge fund managers, subsidies for corporate jet owners, and drilling incentives for oil companies already enjoying record profits. Congress should scrub the tax code of these ineffective corporate subsidies. Require Wall Street to contribute to the middle-class recovery. It’s time for Wall Street to provide some relief to the taxpayers who funded their bailouts two years ago. That’s why the United States should join other countries in imposing a very small tax on trades of stocks, bonds, derivatives, and other Wall Street products. Trillions of dollars in financial instruments are traded every year, so even a tiny tax could raise $50 billion a year in the United States alone. A miniscule transaction tax wouldn’t be felt by ordinary people who “buy and hold” stocks as ordinary investments, but it could curb the kind of high-frequency robo-trading that causes market volatility and exacerbates bubbles. France and Germany are spearheading a European push for an internationl financial transactions tax, which Microsoft founder Bill Gates recently came out in support of. The United States should be leading the effort. An international tax will make evasion much harder for an industry where the nature and location of a transaction is often just a matter of changing the books. To its credit, the Obama administration has proposed a 10-year bank tax called the Financial Crisis Responsibility Fee to be paid only by firms with more than $50 billion in assets. Whatever the mechanism, firms at the center of the financial crisis that caused the Great Recession should also be at the center of the middle-class recovery Americans are still waiting for. Regulate banks and financial firms to protect consumers. The animating sentiment that fuels the protests of the 99 percent is this: After the financial crisis, big banks got bailed out but the middle class got left behind. And we’re still hurting. That’s why the administration proposed and Congress created the Consumer Financial Protection Bureau: a powerful watchdog looking out for ordinary people in their interactions with big banks and other sellers of mortgages, credit cards, and student loans—financial products that weigh heavily today on the 99 percent. But now conservatives in Congress are blocking a confirmation vote for the CFPB’s first director (which it needs to assume its full authority), and fighting to weaken its mandate to take on powerful financial interests. That’s an outrage. The economic hardships facing the 99 percent are a constant reminder of the need for a strong cop watching out for consumer interests. Congress should immediately schedule a confirmation vote and support the CFPB. It should also resist efforts to weaken other new Wall Street regulations in the Dodd-Frank financial reform bill. The federal minimum wage is worth more than a dollar less per hour, adjusted for inflation, than in 1968. The people at the lowest rungs of the economic ladder are disproportionately hurt during times of economic crisis. A boost in the minimum wage would reward these employees for their hard work and help the economy by boosting their consumption of goods and services. If that’s not reason enough, recent studies show that raising the minimum wage is good for people and good for the economy even in hard times. It reduces turnover, makes employees work harder, encourages job training by businesses, and can increase demand for goods and services. And it does not decrease employment, as opponents claim. Congress should raise the minimum wage. A key reason for mounting income inequality is the unequal distribution of political and workplace power. Indeed, countries with high union representation, such as Sweden, tend to have less income inequality. In the United States, employers are using increasingly ruthless tactics to push unions out of the workplace. Meanwhile, labor laws have failed to keep up and have actually been weakened. The result has been devastating for the 99 percent. The share of U.S. national income going to the middle class has steadily declined as the percentage of the population in labor unions has fallen. At the same time, the top 1 percent’s share of national income has skyrocketed. Help Americans get back to work. There is no more pressing problem for the 99 percent than the shortage of jobs. This isn’t just a problem for the 14 million unemployed. Lack of demand for labor keeps wages low, while the buying power of those stagnant wages is eroded by rising prices. That’s why Congress should pass the president’s American Jobs Act, either in full or in pieces. It’s the least they can do. The bill introduced in September will create as many as 2 million new U.S. jobs by putting people to work repairing the country’s infrastructure, cutting taxes to spur consumer spending and hiring, and preventing up to 280,000 teacher layoffs. It will also prevent more than 2 million jobless people from losing their unemployment insurance by doing what Congress has always done during periods of high unemployment: extending benefits to the long-term unemployed. And failing to extend benefits could lead to nearly a million more job losses. The sign of a healthy economy is the well-being of all families, not just corporate profits and a rising stock market. The U.S. economy today is not working for most Americans and that’s why people across the country are demanding attention—and answers. These nine measures are not a cure-all for what ails us but they will go a long way to making the economy work again for most Americans, not just the privileged. And they will help restore the promise of the American Dream: If you work hard and play by the rules, you can build a good life for yourself and your family. Michael Ettlinger is Vice President for Economic Policy and Gadi Dechter is Associate Director of Government Reform at American Progress.